Featuring a modular design complete with two magazine pouches, the UTG Deluxe Universal Horizontal Shoulder Holster is a custom solution for those looking for an economical yet secure solution. 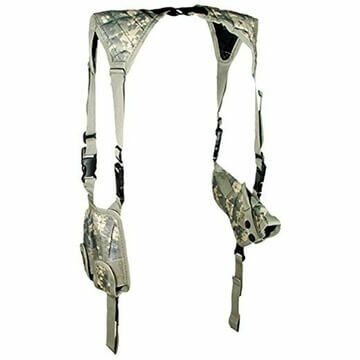 Both left and right handed shooters will find this universal shoulder holster comfortable, practical and versatile. Modular designed UTG holster is available in Black, Od Green, Army Digital and Woodland Digital colors. Both in terms of holsterable firearms and girth of the wearer, size is much less of an issue with this padded shoulder holster than other models all the way around. On one hand, variously sized guns from revolvers to pistols fit snugly and securely in the holster. On the other hand, the unit itself fits the wearer comfortably, snugly and securely, even those with larger than average chest sizes. But on the flip side, the weight may be a factor, although more so in terms of the gun than the shooter. Some heavier weapons may prove uncomfortable for the wearer over long periods in the holster. Interestingly enough, however, while the load bearer may find heavier guns awkward and cumbersome, the actual horizontal shoulder holster itself is quite lightweight and comfortable. This horizontal shoulder holster is simply not a premium product. Users won’t find leather details and Sherpa shoulder padding. However, the holster also carries a mere twenty dollar price tag, and users find it isn’t missing anything in terms of quality construction. The padded parts are comfortable and the straps are secure and easily adjustable for a custom fit. The lightweight as well as functional velcro based components attach to a web belt for the optimum holster and pouch tension.